Driver Education is a 30 hour course where we follow the strictest guideline program approved by the California Department of Motor Vehicles. Our classroom course is usually given in a four day format from the hours of 8:00am – 3:30pm with a one hour lunch. At completion of the course the students receive a completion certificate (DL400b) issued by the instructor and must be present at the time of the initial application (DL44)at the DMV. 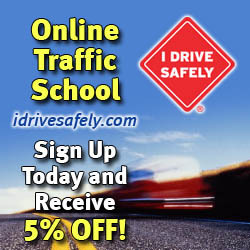 Our Online Driver Ed Course will fulfill your mandatory California DMV Driver Education requirements. It is available 24 hours a day and 7 days a week. You can take this course any time and anywhere at your own pace. Students may complete the reading and testing at their own pace. Students may re-take the quizzes and the final test as many times as is necessary in order to pass the course.The course is divided into 10 lessons with each lesson containing its own quiz. You will have to answer all the questions correctly on each quiz in order to move onto the next lesson. Once you have completed the lesson there is a 30 question final you will need to take in order to receive your Certificate of Completion (DL400c). A score of 80% on the final is passing. Once you have passed the final a Certificate of Completion will be mailed to the address you have provided us. You can then use the proof of completion for the purposes of obtaining behind the wheel training.